Complete obstruction of the right main stem bronchus by a malignant tumor can be an indication for endoscopic resection as long as the obstruction is recent. 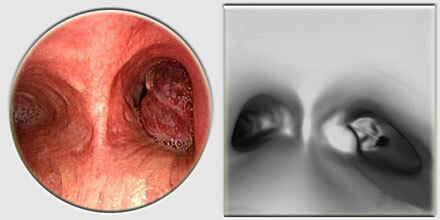 Once again, mechanical debridement with the beveled tip of the bronchoscope is essential. If the tumor is not hemorrhagic, it is not always necessary to use the laser. Sometimes the laser need only be used to coagulate the base of the tumor, which in the case shown here stems from the right upper lobe carina. Extrinsic compression of a main stem bronchus can only be treated by stenting. If the tumor is sensitive to chemotherapy or radiation, there is always a risk of stent displacement or migration as the tumor responds to these therapies. This is yet another case of extrinsic airway compression mandating stent deployment. Chemotherapy or radiation therapy may be used to complete the treatment. Tumor extension beyond an obstructed airway is difficult to appreciate. Gentle prodding with the suction catheter or fiberoptic bronchoscope can help determine the severity and length of the stenosis.